Started playing this again as I am home sick. Again. Gotta love flu season. 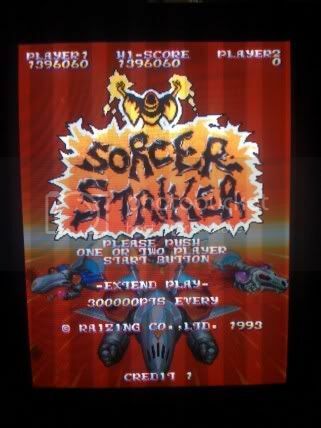 This has been on my wanted list for pcb's for a while now and I just started playing it for score. These runs were made with the Sorcer Striker rom set in mame to see if there are any differences and I can't tell if there are. Seems exactly the same to me, which makes sense as the region is set via jumpers on the board (EDIT: PLayed both a lot these past two days and I think there are differences, though subtle. Can't actually tell if they are just rank or differences in the rom, though). 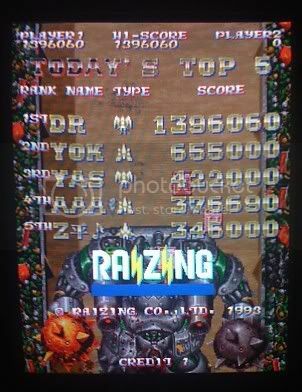 Made it to the stage 6 boss and died twice on his early patterns to finish this run with a new high score of 1,396,060. Pretty close to the loop, may work on it some more soon. Sheesh, I loved my Mahou pcb! I don't know what came over me when I traded it to caldwert! As far as scoring goes, I must admit it is not very exciting. But the game itself has sooo much character and is sooo much fun to just blast through for a couple of credits. You just don't see too many shmups like this one from an incredible year for shmups. The beginning of Cave and the beginning of Raizing! Yeah, you should have hung onto that one. Great game, simple, but challenging. Been playing this one a lot recently. Plays pretty good on mame - even though I hate doing so. It's much cheaper than getting a board, tho.